Kleiner Keiler – pretty bold, that boar! Kleiner Keiler (“Little Wild Boar”) is the young “fun spirit” from Hardenberg and has been in the portfolio since 2004. 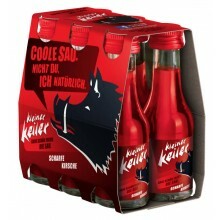 In 2013 the fruit liqueur appeared in a new design and fights against anything that is boring with the claim “Ganz schön frech, die Sau” (“Pretty bold, that boar”). Provocative, bold and sharp – from now on this is Kleiner Keiler! Kleiner Keiler clearly marks its territory in the segment of fun spirits with the extraordinarily striking brand presence and bottle design, and not only attracts attention on the shelf, but also at any party. Party fun through provocation is the motto: bold slogans on products, bottle design with strikingly loud colours and provocative party games on the detachable labels of bottles make any party awesome. And the distinctive wild boar’s head, one of the most well-known trademarks in Germany, is even more prominently placed. The three varieties are also unusually bold. Spiciness characterises Kleiner Keiler and transforms the varieties Scharfe Kirsche, Scharfer Waldmeister and Scharfer Granatapfel into an extraordinarily delicious taste experience.